This current era of wearable devices has started, Google has created an innovative product with smart glasses which we call the Google Glass. While Apple has now also set up a smart watches named Apple Watch. Other companies are also not to be outdone, such as Samsung, Sony, LG and Motorola are currently each have to present their smartwatch products. In addition to glasses and smart watches, some manufacturers also have to bring the smart bracelet or what we call a smart bracelet, another variant of the wearable device is widely used for those who actively exercise. So what functions and advantages of this Cicret smart bracelet? Compared to glasses and watches which do have a specific function, the smart bracelets only serves as a sensor sender information to a smartphone, this smart bracelet device will read the activity of users, and next the smart bracelet will be able to send your heart rate or the number of steps and read the calories users to the smartphone. Various information can be viewed through the smartphone screen. But unlike the Cicret's smart bracelet, because the smart bracelet has a mini projector module in it. The Cicret Bracelet able to re-display the smartphone screen of the mini projector module to the surface of its user skin. The Cicret Bracelet which is still in prototype form, it does look attractive, in addition to providing a futuristic touch, the device has other functions than just the notification transmitter. This bracelet is able to display all the content available on the smartphone screen and show it on the skin surface of the hands of users. As of this writing, the Cicret Bracelet developer still require funding of about €700,000 to complete this project to get into the final stage. 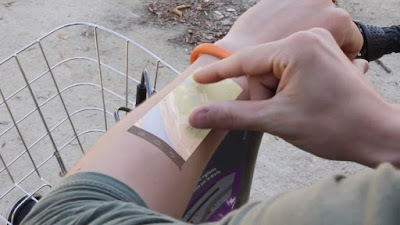 At first glance, the shape of the Cicret Bracelet has a shape similar to the bracelets in general, but behind the colors bandage bracelet that included a Pico Projector module, eight motion sensors and accelerometer sensors and a vibration function that makes this bracelet looks like a magic and can provide a "wow effect" for anyone who saw it. This smart bracelet has a LED notification, WiFi connectivity, Bluetooth and USB port and is predicted to be available with 16GB or 32GB of storage capacity. With smartphone-connected the Cicret Bracelet able to send and receive email, SMS, browsing or even play games and answer incoming calls.